To be a non-smoking is dangerous too, if for example you work how waiter in a restaurant where people can smoke without stop. 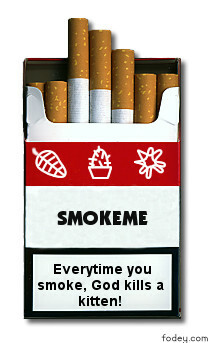 The amount of smoke that these collective swallow during a day can be considered how if they smoke two or three cigarettes packets. 1/ The furious man gives a punch to you. 2/ He, embarrassed, apologizes this situation and benefit the foam extinguisher for shaving him. Either way to smoke is a sure death!